Batted without a bat sponsor and had a bradmanesque run, scoring a triple and a double century. His 329* was indeed a feast to watch. Incidentally he was involved in two massive partnerships with Hussey and Ponting, Who were on the brink. Finished with an astounding average of 125 runs and it was clearly evident that he was confident in his new role as captain. With a draw in South Africa, A win in Sri Lanka and this white wash, There seems to be some resurgence to this Australian side and Clarke sure seems to be the ideal man to lead them on to the next level. The knives were out and the vultures were circling, but like a true champion Ricky “Punter” Ponting played out of his skin to finish as the second highest scorer ofthe series. With two hundreds and three fifties he indeed silenced his detractors that he has some fuel left in him. Right from the moment at 4/27 when he joined Hussey he looked sublime. Followed that up with hundreds in Sydney and Perth and proved that champion cricketers are hard to come by. His catching was also right from the top draw. Another member of the “Dad’s army” whose career was hanging by the thread. However he responded brilliantly by putting on a match winning knock at Melbourne and followed that up with a magnificent 150 in the company of his skipper at Sydney. Finished with a very healthy average of 58 and it looks like he will be around for at least a couple more series. Turned his arm over whenever he was called and held on to some superb catches. Except for his scorching hundred at Perth, He was a tad inconsistent to my liking. Nevertheless that knock took the sails out of the Indians on a lively wicket and brought back some memories of Roy Fredricks. Needs to curb his instinct to be over-attacking at times. He sure looks the part and would serve as Australia’s premier opening batsman for some time. Had an abysmal series with the bat scoring a grand total of 17 runs in 6 innings. If everything he touched turned gold in Sri Lanka, Everything here turned to dust.Maybe a break from international cricket might do him good. that the top order did not leave much work for him to do. Started his debut with a polished knock of 67 before he was undone by a dubious decision. Scored another neat 74 and got a few starts which he failed to kick on. Was reasonably consistent in the series and Australia did not feel the absence of Shane Watson at the top of the order. With Shaun Marsh showing indiffernt form and Watson hinting a return to the lower middle order, Cowan is certain to find favor with the Australian selectors for a decent run at the top. Thought his career was over after the Ashes debacle, but has fought his way back into the reckoning. Bowled brilliantly throughout; perfect mix of aggression and discipline and finished as the series? highest wicket-taker with 27 scalps. Of course, one has to remember this is India. His actual Test, along with with the rest of this Oz bowling attack, will come in grounds outside Australia, but make no mistake, he is back. Australia’s newest spinner was not afraid to toss the ball up. He didn’t do horribly but then again he didn’t impress like the rest of this wonderful Aussie attack. He looked better than Ashwin initially, but Ashwin bowled much better in the last Test. Still has quite a distance to go. Played only the first two Tests but looked damn good. His 4/53 in the 2nd innings at Melbourne won Australia the game, where he broke the back of the Indian batting, taking out Dravid, Laxman and Dhoni. He followed it up with an even better 4/43, in Sydney, accounting for Gambhir, Sehwag, Sachin and Tendulkar. A great find for Australia and has the potential to become a great. Peter Siddle, take a bow. Plugged away in every innings and was always among the wicket-takers. His only 5 wicket haul in the series came on the Adelaide surface; the pitch which had the least reward for the bowlers. His tireless bowling and lion-hearted attitude endears him to any cricket fan. Finished as the second highest wicket-taker behind Hilfenhaus with 23 wickets. Played only one match (the one at Perth), but looked good and could be another Australian pace mainstay. His two victims in the 2nd innings at Perth were Gautam Gambhir and the Master himself, Sachin Tendulkar. In hindsight, bringing him in instead of Lyon in Perth was a masterstroke. Was brought in for the last Two Tests, and performed his part admirably. He picked up 6 wickets, including 3 in the 2nd innings at Adelaide, but he kept the brakes off the Indian batsmen and never let them off the hook, as an economy of only 2.29 proves. Despite a tendency to give Sehwag a lighter leash than other Indian batsman mostly for his ability to create that match-winning innings, even he will agree that it is getting too much. A horror tour for the opener, with a highest of 67 only in the 1st Test at Melbourne. His 50 in the 2nd innings at Adelaide reeked more of desperation than intent. The sudden revival of the “Dhoni-Sehwag rivalry” theory only brought more pressure to an already beleaguered Indian team, and his captaincy wasn’t amazing either. This can’t be “The Wall”. It really can’t be. Dravid tried his best, but something went horribly wrong somewhere, resulting in him getting bowled in almost every innings. His 68 in the first innings at Melbourne promised much for the series to come, but it all fell away. Has his seemingly insurmountable technique deserted him once and for all? He is talked about as the next Indian Test captain, but going by this series, he still has a long way to go. He’s never been the most technically-correct player, but the Aussie bowlers sorted him out very well, either getting him to hang his bat outside off or just exploit his weakness against the shorter stuff. Take away his 83 in the 2nd innings at Sydney, and he has a batting average of 14.00 in 7 innings. Ran his mouth a little too often about rank turners and what not. Easily the best Indian batsman in this tour, but we should still pause before automatically calling him a successor to the one of the “Big three”. Good scores throughout the series, especially in the 1st innings at Adelaide. But the entire “Fingergate” fiasco, his aggressive press conferences and that completely stupid run out in the 2nd innings at Adelaide take much of the sheen off his good work on field. Like Rahul Dravid, where did the good old Laxman go? Never got going and constantly fished around off stump, getting out cheaply innings after innings. Of course, he can’t be expected to bail his team out always, but at least once, maybe? Rumors are rife that he has played his last Test, but this really would be the most horrid way for Laxman to go: failing in a series against an opponent he has thrashed over and over again. Played just one Test but impressed. His keeping was agile and up to the mark, maybe because he didn’t have the burden of captaincy hanging over him? His 35 in Adelaide showed his more-talented seniors how to grind it out. Must be preserved and kept for the future. By the way, was anyone else reminded of Tatenda Taibu by him? Still hasn’t scored that hundredth 100, but along with Kohli, among the best Indian batsman on the tour, which isn’t saying much. India badly needed him to get those “daddy” hundreds but an 80 in Sydney proved to be his highest. It was a bad rerun of how Indian batting orders used to be in the past; Sachin getting out and the rest falling like ninepins. You have to wonder, how much longer can he carry the burden of this creaking middle-order? Zaheer gets one extra point for, surviving till the end of the fourth Test and not breaking down with injury! He bowled well, but never got any kind of support from the rest; nor could he conjure up that match-turning performance. If it’s any consolation, he did end the third highest wicket-taker in the entire series. But how long will this team rely on Zaheer? Along with Kohli, Umesh Yadav offers a semblance of hope for the future. Bowled fast, wasn’t afraid to bounce the ball and deserved his 5 wicket haul at Perth. Good care must be taken of him, so that this aggressive mentality is encouraged, not curbed like a Munaf Patel as Indian coaches are apt to do. Impressed in fits and bursts, but has just held on to his place, edging out Harbhajan. It would be unfair to expect a lot from a young spinner in his first tour to Australia, and Ashwin did just about enough. He gets an extra point for his exploits with the bat. Looks a compact player if he can take his batting a tad more serious. The myth about Ishant is fast fading. How long will he get away by pointing to his bowling and saying he was “plain unlucky”? Shows he still hasn’t progressed from his first tour to Australia and keeps on pitching the ball in the same areas. Unfortunately, the batsmen knew what to expect from him now. Has to pitch it up a bit more, otherwise he’ll just go on beating the bat instead of taking the edge. What was he doing? Why was he even played? Vinay Kumar was thrown in at Perth, bowled 13 overs in two innings and was smashed for 73 runs, bearing the brunt of Warner’s fury. He was supposed to add an extra bit of pace to the attack, but err…..let’s just say, he’s still stuck in the “medium-pace” category. Test player is not in any danger. 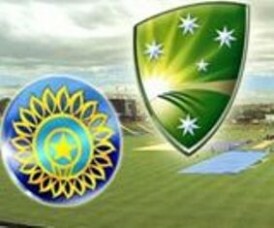 India still need a wicket keeper and a leader so he will hang on for a while. However he has to improve his batting by leaps and bounds in Tests and his keeping was also lacking at times. Was too defensive as a captain and needs to rethink the way he approaches Test matches. Would have been a very happy man when he was slapped with a fine, coped a ban and missed the final Test.The heat was taken away from him for a short while. Dhoni’s career as a Test player is at the cross roads and he needs to rethink fast if he has hopes of regaining his Midas touch. Marsh too high (deserves 1 for that fantastic catch I guess, but all that did is prove he wasn’t toking :ph34r:), and Haddin maybe a bit high. Neither did a thing with the bat, and Haddin going so slowly in Adelaide was clearly against the wishes of the captain. My first thought was that Warner wasn’t quite an 8 but that hundred in Perth was pretty special. Still he didn’t have many other highlights, though he was great in the field. Thought Lyon went ok in Adelaide but his score is probably fair given he was a non factor in Melbourne and Sydney. Clarke 9, Hilfenhaus 8.5 and Siddle 8 is laughable. As is Ashwin getting the same mark as Lyon, and Zaheer and Yadav getting 1 less than Pattinson. Clarke 9.5-10, Siddle and Hilf 9-9.5 IMO. In my ones I gave the first 3 all 10’s (plus Punter).